The first of your DUI court appearances may come the morning after your arrest if you are held in jail overnight. In other cases, it may be your arraignment after a police officer released you after your arrest. The arraignment could be the next day. It could be months later. It is possible that the first time you have to appear in court is to answer to a felony summons after an indictment. Each state, county, city and court have their own procedures for DUI initial appearances. For specific information about what to expect the first time you go to DUI court, review your state, city, or county of your DUI arrest. As a general starting point, initial appearances designed to inform you of how serious the charges are. In every state in the U.S., an impaired driving charge is serious, and in the vast majority, even a first offense is a crime with potential or mandatory jail time. As a rule of thumb, take the initial appearance very seriously. If at all possible, make sure that you have an attorney representing you. Some prosecutor's offices offer the best plea bargains during the first court date. It is essential to have an attorney so you can get the best deal possible on the table and properly evaluate the deal. When you go to your first court date, be sure to dress like you are taking it seriously. The Judge may evaluate you to make a determination of whether to set bail or require you to report to a probation department while your case is pending. The better dressed you are, the more the Judge will think you are taking the charges seriously. The more seriously you are taking them, the less likely in most Judge's minds, will be the chance of you fleeing or committing a crime while on release, if they allow you to walk out of the court without bail. You'll have to stand up and answer to the charges. If you have a lawyer, typically the attorney will do most of the speaking for you. The Judge may read the charges against you and ask you how you plead. Typically it is not a good idea to plead guilty right away, but there are certain exceptions to this rule. Some courts set a defined schedule that your entire case will follow. During court, you will know when all of your court dates are, including a trial, should it come to that. Your given only the next court date. Your required to sign a promise to appear at your next court date. Some courts may require you to attend AA meetings. Some may require you to get an ignition interlock device, wear a SCRAM device or check in with a probation officer. A DUI lawyer can be very effective in helping you avoid or minimize these requirements.. Experienced DUI lawyers typically have an exhaustive checklist of things to request. The first court date is for your lawyer to ask the Judge to preserve evidence for testing. 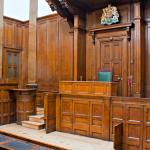 In some courts you must ask for a jury trial during the first court appearance. If you don't, you could lose your right to have a jury. So if you have to go into your court date without a lawyer, make sure you know what the local rules are in regards to jury trial requests.